Two episodes in and I'm completely sold on this drama. It's nutty to the point of surreal, but even that somehow works to provide a fluffy, dreamy watch that makes me smile. The original Taiwan FTLY was one of my drama addictions back when it first aired, though I admit to growing weary of the excessive dramatics by about midway through. 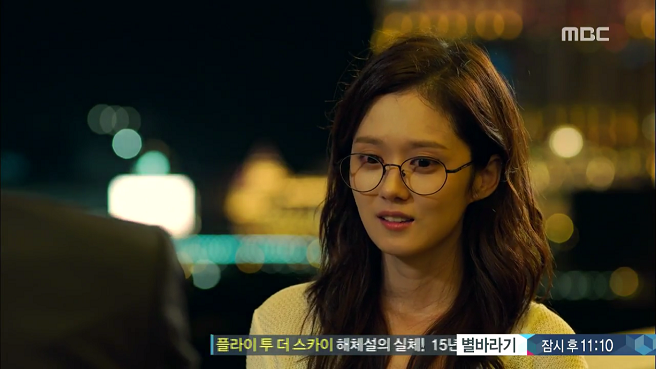 I'm really hoping the Kdrama version steers clear of all that, but even so I think the premise is fairly unique (not often that you get one night stands in dramas), and I can already tell that I'm going to like Jang Nara much better than Chen Qiao En as the female lead. So far FTLY is sweet, romantic, and hints at much potential ahead. I never watched Successful Story of a Bright Girl, but I'm kind of tempted to now after seeing Jang Hyuk and Jang Nara in action. I was skeptical as to whether Jang Nara would be able to generate chemistry with her male lead, especially in the context of a bed scene (because let's face it, she looks like a little girl with her teensy frame and doll-like face). But something happened once they were together, and I could understand the hype around their reunion. I find them believable as a couple, and like them both individually and together. The scene that convinced me of their compatibility together wasn't actually the bed scene (which was honestly super weak, even by Kdrama standards), but the chat they had after the casino victory. It felt so sincere and heartfelt, and you could just feel how meant-to-be they were as characters. When the absurd is pushed aside, you're left with two vulnerable people who are complete kindred spirits, which I think is completely boosted by the Jangs' mutual comfort with one another. As for Jang Nara, I just love her in this role. She makes an otherwise flat character believable in a way that the overly gorgeous Chen Qiao En couldn't come close to. With Chen, it was clear that we were watching an actress playing a role. With Jang, I feel like I'm actually seeing the oft-rejected, too-kind Kim Mi-young. There's a raw edge to how she plays the rejection and innocent hope, which makes the character seem genuine and more than just a paper role. I often have a hard time sympathizing with teary female leads, but her scenes here did the opposite and actually made me appreciate her character more. I'm excited to watch her growth as the drama progresses. Interestingly, this is the first time I've watched anything with Jang Hyuk. He has a high bar to beat against Ethan Ruan, but I like his fresh take on the Lee Gun character. Rather than playing the conventional perfect chaebol, Lee Gun here is entertainingly eccentric with his big-mouthed laughs and extreme expressions (that shampoo scene - ???). It's better this way, because we're getting more than just a poor-girl and perfect-guy pairing; there's a full meshing of personalities, and it never hurts to have more humor along the way. I can also tell that I'm going to like the grandma here MUCH better than the annoying, hyper-squirrel one from the Taiwan version. Not sure if I've mentioned it, but that Taiwanese old lady actress has played basically the same exact character in about ten million Taiwan dramas. It's cute the first time, but quickly grows old, and the more you see of her the more you can tell it's just an act. I like the serious, understated humor the actress here brings, even if I still have bad memories of her from Hundred Year's Inheritance. Second-lead characters are also fine so far, in that Wang Ji Won has far more depth as an actress than Bianca Bai and Choi Jin Hyuk looks nice (even if he hasn't had to do anything). I'm looking forward to their interactions with the leads if nothing else. Now, for the more controversial part - the oddball storytelling and directing. I really didn't like it for much of the first episode, which came on a bit too forcefully, with weird scenes and outright annoying music. I actually like the music now, but the tone as a whole takes time to get used to. I still feel that most of the shots in episode 1 were completely useless (e.g. the shampoo commercial and the dog chase), but luckily things settle into a rhythm by episode 2, and we get some heartfelt moments in place of the crazy. Regardless, I appreciate that they made some attempts to distinguish the feel of this show from the original version, so that things feel fresh even though the script is nearly identical. Can I just say though that the convoluted mess that led to them both being drugged was unbearably stupid and evidence of super lazy writing? What person thinks to fish out a bottle from a fountain and drink it? I also thought she was supposed to be sneezing from a cold, not coughing, in which case water is completely useless? Luckily I can't fault the show too much because everything else tells us to not take things too seriously, but honestly, it wouldn't have been that hard to write even a marginally more believable scenario. Beware, discussion of potential spoiler ahead! One of the things that bothered me the most about the original Taiwan drama was the contrived, idiotic mess of misunderstandings car accident scene that killed off the baby. We spend all this time building up the baby as a character and as a critical link between our adults, only to destroy all that in a completely senseless, pure drama moment. I can't even stress how much I hope the Kdrama decides to change that. For one, I want this baby to be fulfilled as a character, because to kill him off beforehand makes that into no more than a plot device, and cheapens everything that happened previously. And second, the cause of the accident was frustratingly makjang, and I can do without that. In fact, the whole second half of the Taiwan drama kind of turned me off. The leading lady's convenient transformation, the extended misunderstanding, the oddball humor when they did reunite - it lost much of the magic and innocence of the early half. I hope the shorter length here will tone things down, but who knows. All in all, a better start than I expected for this drama, given the bad track record with remakes. Again, I hope this show doesn't go the over-dramatic way of its predecessor, and stays with the cute, because there's so much promise here.